Since a couple of decades ago, catch and release has become a common practice in British Columbia and also other parts of the world. This practice is either done voluntarily by anglers or is mandatory in some fisheries. When catching and releasing fish, anglers often like to photograph their prized catches to preserve the memory. Lets face it, sometimes we enjoy bragging about our catches and the best way to prove it is by having photographs of your fish if you cannot bring them home. The introduction of digital camera has made the process of capturing the perfect shot of your fish very possible under most circumstances. Photographs can be taken, reviewed on the spot and retaken if necessary. While technology has reduced that learning curve, there are still some basic preparations and practices that you should be aware of. In this section, we have a series of fish photography articles that may help you to take better photographs at your next fishing trip. We are not professional photographers, so these are simply suggestions from what we have experienced over the years. We hope that you find these useful and look forward to see shots of your next prized fish. 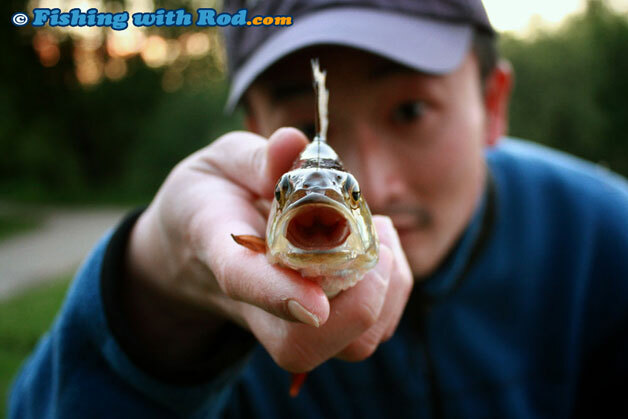 Should you use one hand or two hands to hold your fish when taking a photograph of it? It depends on the size of the fish. How the fish is held can determine whether it stands out or not in the photograph. When taking photographs of a fish that you intend to release, the most important thing to remember is to treat your catch, or subject, with great care so its welfare is not jeopardized when released. The camera angle brings out the best of a subject, this is no exception in fish photography. Find out what the best angles are when taking a picture of your prized catch. The subject of your fish photograph is your fish, so be sure to make it stand out by focusing on it. How a fish should be focused depends on its size. What do you do when you wish to take a photograph with your fish but you are by yourself? Here are some tips to make this task easier. The sun can be your best friend or your worst enemy in fish photography. Pay attention to its position and angle before pressing the shutter button. We all like to show how high the salmon and trout can jump at the end of the line. Capturing this image needs a proper camera, precision, bit of luck and plenty of practice.